One of these days, this little street on the coast is going to fall down on the beach below unless something drastic is done. It’s an example of coastal erosion, which is a normal thing and perfectly fine unless you build a street, or even houses, very close to the edge of a seaside cliff. 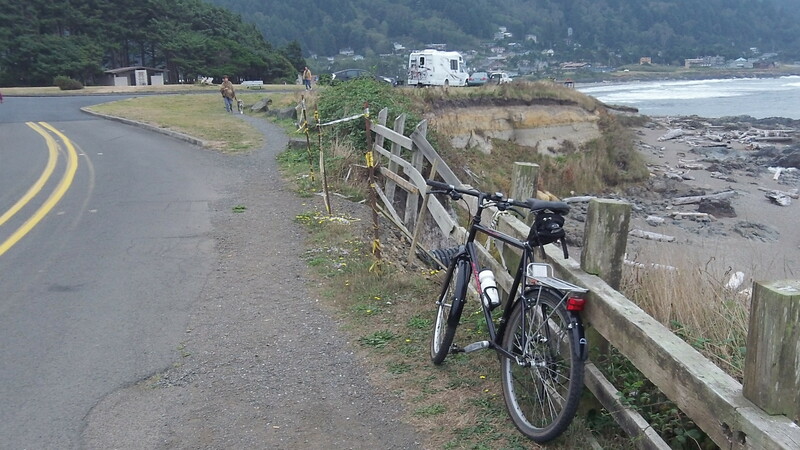 The photo shows a section of Ocean View Drive in Yachats, a street that has had to be moved landward a few times. Somebody, presumably the town, put up a makeshift fence to keep people from falling down the cliff. But the fence itself seems to be falling down too, or at least falling apart. Erosion is a natural process on a coast lashed by west winds and winter storms. Elsewhere it’s being kept in check by the placement of massive amounts — I would guess thousands of tons — of rock or “rip rap” against the cliff. But in this particular spot, not much rip rap is in evidence, perhaps because nobody wants to cover the little beach below the cliff. South of here, erosion has caused some interesting formations in the layers of basaltic rock, the result of volcanic eruptions and lava flows millions of years ago. And in one spot, erosion as exposed the fossilized trunks of spruces that were cut down by an ancient landslide or tsunami. The trunks have been dated to be 55,000 years old.